This is a Elfcarron, a test island for new map styles I am teaching myself and developing. If you're interested then I may open up Elfcarron as an open source world for other writers, designers and world builders to play in. I love this style and will be producing a tutorial to show you just how to draw your own map over on The World Building School as part of The Authors Guide To Drawing Maps. 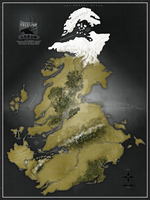 If you like this map then I've published it as a customisable map pack over on Graphic River. Click Here to learn more about what's in the pack and how to purchase it The pack is only $3. Hey guy, its really cool world map. do u use reference for design your maps? Thank you for the compliment. No, the terrain on this map was randomly generated so I don't really use references. Awesome map, awesome tutorial. 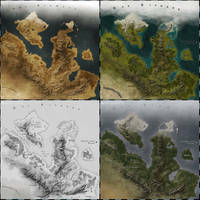 Even inspired me to revisit my own fictional world map. So glad that you liked the map and that it's inspired you to get back into drawing your own world map. Hope you're having a great week? So sharp, so clear, so…inspiring. You shall consider me a pupil interested in the supplied tutorials in the description, I thank you! I've written the first two parts to the tutorial so the first part will be going up on The World Building School this Friday. I do hope people enjoy reading it. Send me a link once you've uploaded you're result as I'd love to see what you come up with. Consider it done, even better, you could always watch me! It's a very clean and attractive map. Could due with a few other elements, such as a scale and compass rose, but nice work! Cheers Arsheesh, I'll take a look at the link. 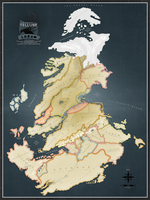 Also I think it's about time I started to be active over on The Cartographers Guild. I've lurked from time to time but kept forgetting my password plus struggled to navigate the forums. And I quite like the idea of entering some of the competitions to see if my maps match up to the talent in the guild. Glad to here it! I look forward to seeing you around over there. The competitions are always fun. I've only ever entered in one myself, but when I get some time I'd like to participate more myself. 1/ what is the scale ? 2/ what is the name of the big bay in Zarun ?